At last the final club trip of the season had arrived, I had been looking forward to it for awhile... and the last week has dragged somewhat! This time our flight out was at a much more agreeable time of day, and so on a lovely sunny morning the What’s App group was busy with news of an hour wait to get through check-in, not wanting to lose too much drinking time, I headed down to T2, checked in there and walked back to T1 and within half an hour I had joined the growing number of members, who as usual were in good spirits and looking forward to the weekend ahead. After a few opening drinks, we boarded the plane and soon arrived at Stansted to be greeted by grey skies and rain. The owner had his usual speedy airport exit curtailed by those who had to put bags into the hold due to Ryanair’s new bag policy! Not to worry, we were soon all on the train. The President got out the quiz questions and in no time at all we had pulled into Liverpool Street. A brisk walk in the rain got us to the Premier Inn at Aldgate East and we checked in. So relieved of our bags the first stop of the afternoon was the Bar Locks, then onto The White Hart where the party divided, some in front of one TV watching the Rugby, the others in front of the other TV watching the football! As the drinking started to kick-in, one member while looking at the menu said he wasn’t interested in having the “Mushy Pies”. Then another member was accused of having some resemblance to actor Roy Scheider from Jaws fame. As he stood to take a photo another member came out with… “You’re gonna need a bigger camera”. After the sport had ended we made our way back to the hotel to change into our evening attire before re-convening back at the White Hart. 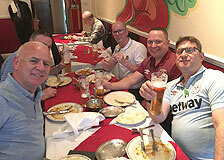 After a couple of drinks we split up again as one party headed down to Brick Lane for a ‘Ruby Murray’, the other party had a table booked back in the hotel restaurant. 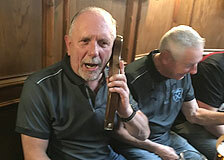 After eating we all managed to find our way back to the White Hart, more drinks were consumed, and before long some members managed to upset the manager who requested that they keep the noise (specifically the singing) down. By this stage one of the younger members had lost his phone, the owner wasn’t happy, then it was miraculously found... under the pillow in his room! Panic over. 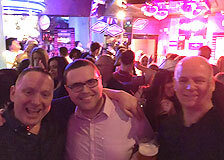 Around 10.30pm we got into cabs and made the short trip to St. Pauls and the Reflex Nightclub, a club playing exclusively music from the 70s, 80s and 90s. The older clientele suited our club age demographic and half an hour later, drinks in hand, we were all to be found on the dance floor. 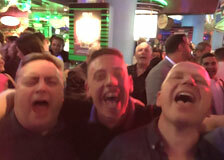 The truth is we had a cracking night, everyone in the club had smiling faces, were dancing their socks off and sang along to all the songs, I even found myself belting out ‘Club Tropicana’ by Wham! Come 2am the day had started to take it’s toll and we jumped into cabs back to the hotel. Us old’uns headed to bed, while the younger members in the party decided to carry on and headed back out again! Sunday morning found members moving very slowly indeed! 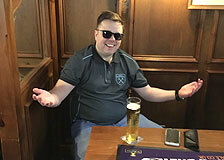 Breakfast was had at the hotel and after checking out we took the short underground journey to Stratford and into the Black Bull where as usual we received a great welcome! 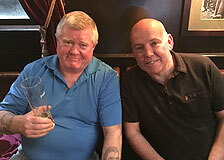 The bags were put into the lock-up and the first of the days drinks were purchased. 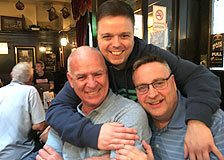 The members who had travelled over early on the Sunday morning to meet up with us remarked at how quiet we all were… I wonder why! 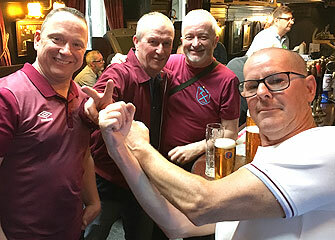 However once the 2nd and 3rd pints went down normal service was resumed, the jukebox started up and the pre-match build up began in earnest. A brief panic ensued when he “who would if no one else will” lost his match ticket, much to the relief of he who had lost (albeit temporarily) his phone! “That’s the heat off me” he said. 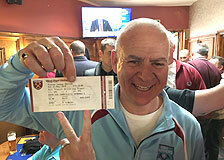 However a quick trip down to the ticket office at the ground and everything was sorted. 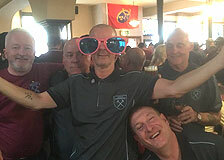 With the Black Bull packed to the rafters the first of the days serious sing songs started with a rendition of the Arthur Masuaku song, the one where he never gives the ball away… if only it were true! During the fun the arm from a chair somehow managed to become detached and was passed around members before being carefully replaced! Then it was time to make our way to the stadium. Thankfully the weather had cheered up from Saturdays downpour and we enjoyed the bright warm sunshine. 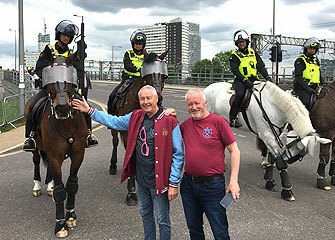 Upon passing some mounted police, the chairman decided he wanted a photo taken, so after politely asking he stood next to the horse. Casually he lifted his arm up to the horses mouth, which proved to be a mistake when the horse dribbled all over his hand! 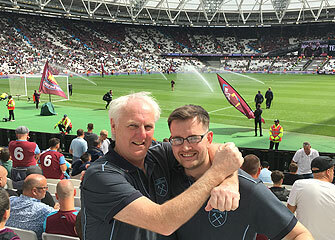 After the photo had been taken the chairman was seen holding his hand out on front of him and walking towards the grass verge so he could wipe it clean… much to the amusement of the coppers! Onto the game itself, which in complete contrast to last seasons shocker, turned out to be a cracker! Final score 3-1 to the Hammers, 3 great goals, 2 from Lanzini and 1 from Arnie. A great atmosphere in the stadium and plenty of singing and taking the piss out of the Scousers… “you’ve got Sam Allerdyce” was a song that produced a lot of smiles, not in the Everton end I might add. Then after the Everton goal keeper Jordan Pickford had flapped at Arnies goal bound shot everyone in the Bobby Moore Lower started waving frantically while singing "lets all do the Pickford", this was closely followed by “England’s, England’s number 3”. Who said humour was dead at football these days! 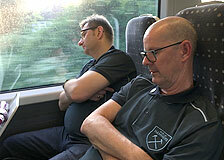 Once the match had finished some of us stayed behind as the team did it’s end of season 'thank you lap'. A special round of applause was reserved for James Collins, who at the end of the season will be out of contract. A song urging the club to “sign him up” again was continually sung throughout the game and proved to be very catchy. 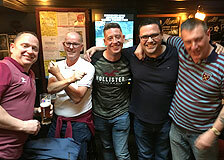 Back at the Black Bull the after match party was in full flow with rousing renditions of Sweet Caroline and Bubbles, two which lifted the roof off! 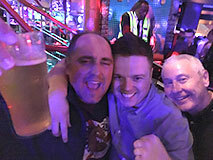 Word spread that one member had won a nice little sum at the bookies, he had a smile on his face and later on back at the airport he generously bought us all a drink… like we needed any more at that stage, but there you go! 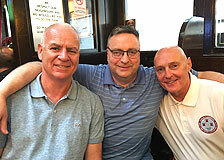 Come 7pm we left the Black Bull and made our way to Liverpool Street Station where we boarded the Stansted Express. The President got the quiz cards out again and tried his best with those members who had not fallen asleep immediately the train left the station. 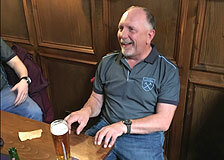 Normal service was resumed in Weatherspoons at the airport as we all enjoyed a last pint or two! 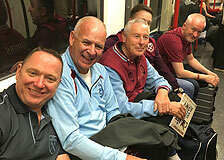 A band of very weary Dublin Hammers arrived back in Dublin around midnight. Special thanks go to the travel sec. who, true to form, organised yet another hassle free trip. Thanks to all my travelling companions for 2 days of laughs and good times, your company really is the best, and last but by no means least, thanks to the President for the quiz questions and the endless stream of jokes. Report by Paul Smith. Photos from everyone!